In previous article, I have explained the concept of implementing restful web services with google GSON and Here in this article, I am following the same example code of previous article. So before reading this article please refer previous article. Now I am going explain AngularJS integration with restful web service. If you are new to restful web services, then learn it from the previous article. Here you need some basic idea on AngularJS. 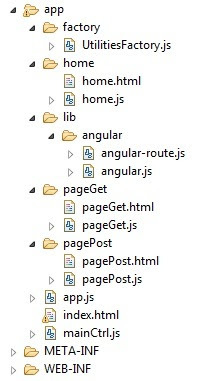 Observe the below image, there you can find AngularJS single page web application structure. This file contains main controller of the application. This controller will be loaded at the time of application loading. This file contains util functions - HTTP Get and Post request methods. Here empleyeeId=2&version=1 is is the input. Now observe the below java code of implementing POST REST method. Here inputData variable will have whole input data. So we have to send whole JSON string under input data.